For April, we'll take advantage of longer daylight and mild weather - before it gets hot - to hold our annual "Casting Meeting". Come starting at 6:00pm, or whenever you can arrive, and bring your favorite rod. If none, the club has a few sets for use during the session. 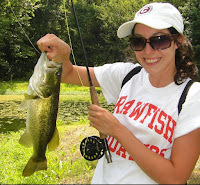 Cormier's 2nd Law of Fly Fishing states, "Casting prowess equals fishing success". Many flycasters work tirelessly on improving distance, and that's good. But 90 percent of all fish are caught within 50 feet. For that reason, accuracy is far more important. To help us improve our accuracy skills, we'll be doing a Casting Game. We'll share tips on practicing for accuracy, and analyze for improvements. Afterwards, we'll gather inside to recap what we learned from our casting session. As well as discuss a few business items including the club caps and shirts, Summer Workshops, and NLFF Masters Series. The International Federation of Fly Fishers (IFFF) is now Fly Fishers International (FFI). The largest organization dedicated to the sport of fly fishing underwent a name change on April 1st. The name change came after a marketing study in which "brand identification" was tagged as one of the issues in reaching out to the growing number of young fly casters. While a name change is only a small part of the overall marketing effort, it's one that has made the most news - and favorably at that. A logo change also has been made. One of the new logos is shown on left. Also, if you click on their old website domain name, www.fedflyfishers.org, it will take you to www.flyfishersinternational.org. 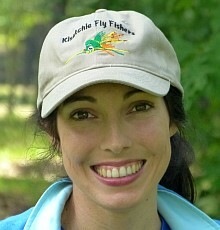 Since Kisatchie Fly Fishers is an affiliated club of FFI, we will have to make some changes to our website and leaflets. Fortunately, there's great timing here - our updated leaflets were going thru the proofreading process when the name change was announced! Our annual Fly Fishing 101 was another big success! With 18 students - beating last year's record participation - we had great weather for fly casting outside, while Gene Taylor and others gave instruction inside the classroom on knots, leaders, and flies. Everyone got handouts, including a list of places to fish in north and central Louisiana from bank or boat. Thanks to everyone who helped as instructors, organizing or bringing important stuff like coffee, donuts, fruit, and drinks: Rich Hudson, Gene Taylor, Roger Breedlove, Jim Johnson, Rich Dewees, Chris Perkins and Glen Cormier. Also big thanks to Kristi Butler for her assistance and giving the group a tour of the hatchery prior to the workshop! Arnold Gingrich once said, "Fly fishing is the most fun you can have standing up. Or sitting down.". If you've ever wanted to find out what makes this sport so addictive, here's your chance! 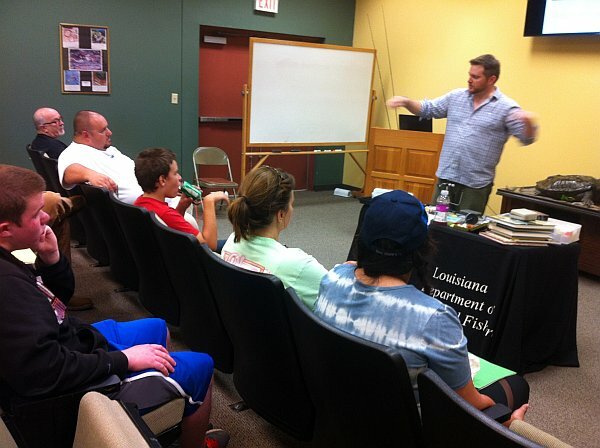 This Saturday, April 8th is our annual "Fly Fishing 101" workshop at the LDWF Booker-Fowler Hatchery in Forest Hill. Time is 8:30am to 12 noon. It's FREE and open to the public. Coffee, donuts, refreshments, handouts and door prizes! FF101 is a 3-hour hands-on workshop that covers the basics of fly fishing, fly casting, knots, leaders, and flies often used. Details and a schedule can be found by clicking on the menu above on "2017 Fly Fish 101". Bring your rod/reel if you have one. If not, the club has setups for use during this workshop. Please pre-register by calling 318-793-5855 or email catch@laflyfish.com. Thanks!